You are reading this because you want more out of life. 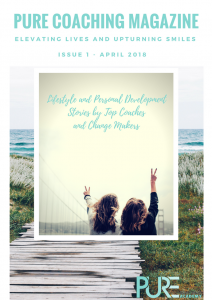 You are interested in discovering insights, tools and techniques to help give you great satisfaction in life, to learn how to overcome emotional obstacles that hinder success and to live your life at your full personal and professional potential.So I am delighted to bring you the launch of the first ever Pure Coaching Magazine. Chock full of super insightful features by top coaches trained at the Pure Coaching Academy each coach offers great ideas and tips that will seriously upgrade your life.The magazine is beautifully laid out in colourful lifestyle pages so take time to read each feature and enjoy the shared wisdom which is designed to enhance and enlighten. Special thanks to all the Pure Coaching Academy graduates who contributed to the first of many editions and a round of applause to Caroline, my VA, for her superb design and commitment to the project. Have a super day and please pass on Pure Coaching magazine to friends and family who will benefit from its content. Enjoy.